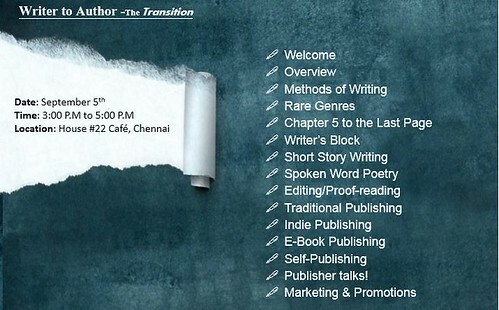 If you are in/around Chennai and you aspire to become an author, I have some news for you. There will be an event on Saturday, September 05, 2015 @ House #22 Cafe near Olympia Tech park/Jyoti Theater, Chennai. There is no entry fee, but you pay for anything you eat. For courtesy’s sake you could eat/drink something so that the people who have given the venue get some business. I guess this will be more of an informal/interactive session where authors share information and experiences while publishing their books, and aspiring writers can learn and also contribute. The topics to be covered are mentioned in the above poster. If you want to come, please message Kavipriya @ Facebook. She will add you to the event page.